Bolero is used for lifting, moving and bathing dependent residents. Using this lift bath trolley, the resident stays safely and comfortably on the stretcher during the whole bathing cycle. Bolero allows one single attendant to take a dependent individual from bed to bath, and back again without any manual lifting or extra transfers. Transfers can be made from either side of the bed. The feeling of safety for the individual is enhanced by the hand grip and the two safety straps. Designed for easy operation, Bolero is highly maneuverable and has also been fitted with a straight steering device for corridors with height-adjustment controlled via a handset. Options include a side rail and electronic scale. Bolero is compatible with ArjoHuntleigh height-adjustable tubs. By offering optimum support, Bolero enables residents to gain maximum benefits from bathing sessions. With this lift bath trolley, a caregiver can safely bring dependent residents from bed to bath and back again without manual lifting or extra transfers. Bolero can give dependent residents easy access to regular bathing. As one caregiver operating Bolero is able to manage the whole bathing cycle, the efficiency of this procedure is considerably enhanced. 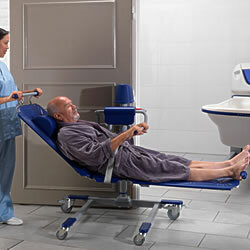 Battery-powered height-adjustable lift bath trolley for lifting, moving, showering and bathing residents. Height top of chassis: 6-1/4"